Vintage 50's Sweater (similar, also similar): Thrifted. 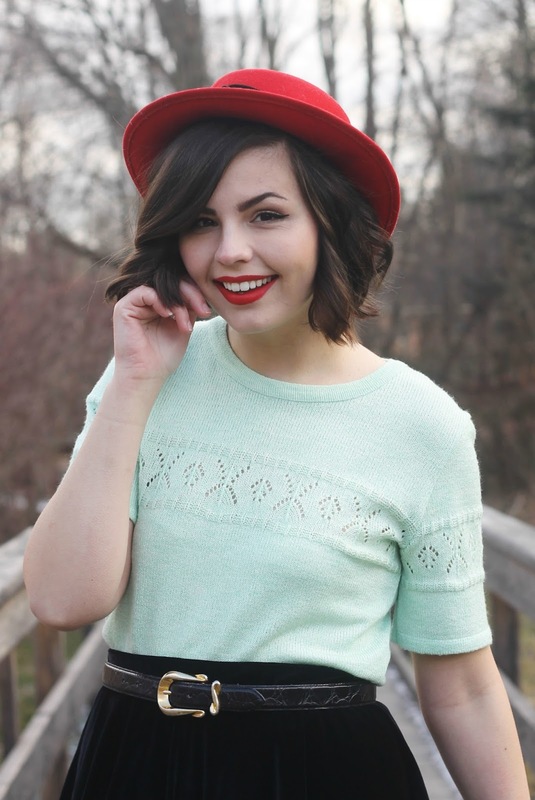 Red Boater Hat (SUPER similar! ): Thrifted. Belt (Similar from Kate Spade): Vintage, my mother's. Heart Tights: (found the exact same as mine!) c/o OASAP (very old). Thank you kindly to everyone who read my last post and reached out through comment, email, or message. I read everything you write to me and appreciate each supportive word very much.I'll keep you updated on my journey with Him as things move along or stay stagnant. I love having you involved in my life--it is what I cherish most about this blog. In my classes blogging is a huge, focal topic. As a power that influences advertising, publishing, sales, and fashion itself: blogging is an integral topic any fashion student covers in his or her studies. We're reading a book right now called Blogging You Way to the Front Row and it is interesting. Sometimes I'll go through periods of time where I'm very motivated to grow my realm of influence in the blogging world. Not necessarily have I ever wanted to be so successful as to be sitting front row, but having an impressionable blog with good metrics flows in and out of my personal goals from time to time. The problem with this thought process (for me at least) is I feel fake. The content I put out I like and aligns with my "blog brand", but it just feels contrived somehow to set out with the mission to achieve x,y,z. I wish I could have the entreprenurial mind set when it comes to my personal blog! In this blogging book we're reading the first step of a successful blog is defining your purpose. As I was reading this in the bathtub last night I ran over a dozen or so ideas of what my blog's purpose might be. The only one I've found consistent over six years that brings people back to my blog is my honesty. My outfits are alright. My photography sub-par. My writing messy. Honesty about my life, however, has always struck a deeper chord with readers. It's also what I enjoy seeing in the blogs I read. Despite having identified honesty as my blog strength, I've discovered it can be easily over done. In the past I've tried to write about a monumental change of heart every day...but over the years I've found that's impossibly exhausting to do. Real life doesn't work like that! I don't have revelations every day, so why write about something I'm not fully experiencing? Although my posts have become sparser, I'm happier with the content I create because it reflects a more valid depiction of my growth. A blog's strength doesn't have to be one that makes you money and it doesn't have to be one that gains you followers. I've tried these missions and they felt so out of line with what I want to do here. Blogging your way to the front row may be some bloggers mission, but mine has always been simple: revealing we're not as alone as we think we are. Well, I'm glad if my comment helped in any way? I've had so many lovely comments from my true and loyal supportive friend-readers over the last couple of days responding to my post and encouraging me in my stress that it is heartening and their empathy in showing that they have been there before has been truly kind and inspiring and they are the type of people who I am so lucky to know and I want to support reciprocally. You know your blog is good, no false modesty, it isn't necessary. You do a LOT of very good things in terms of photography (PAH to sub par), outfits and other things as well as your refreshing blatant honesty that somehow makes people feel that they can share their thoughts here, even if they aren't sure of what your response is to their contributions. I like blogs that make money as well as those that don't. What I value above all is responses. I quickly lose the impetus to comment and be part of the dialogue if I feel it is too false or superficial without honesty or the person doesn't give a stuff about what I say. ..oh and I thought this outfit was very pretty! I think you sell yourself short, lady! I love your photography and your outfits...I don't know any other bloggers that do thrifting better, and I love thrifting for so many reasons (better for the wallet and the environment)! It's inspiring to see what you put together and you have a great eye for setting. I do love your writing, too, and I will say that being a more "pro" writer does not necessarily make one a better writer. You write from the heart and that's what makes it engaging and genuine. I've been reading your blog for a few years and I'm not sure I've ever posted but just want to tell you that your artistry is appreciated! I like blogging for myself rather than blogging to sell myself. I don't want to get to that point where I'm being paid to promote other people's products, because I feel like it will cheapen myself.